2019 is almost here! And with the new year comes new digital trends, such as the ever-changing world of UX web design. I’m sure if you took a moment to think back through the last few months and your experience with websites, you would probably be able to think of a handful that stuck out to you based on their user-friendly interface and appealing layout. The same goes for the websites you visited that were a terrible user experience - they stick with you and leave a negative connotation with the brand. In today's vast and saturated online world, an amazing user experience and creative web design aren't unique - they’re expected. Therefore, we took the time to highlight these UX and design trends we think will make a major impact in the web design world this year. One trend you might notice throughout the article is the fact that designers are using video and movement opportunities to grab the users’ attention and keep visitors on the page for longer periods of time. What is the ultimate web design strategy that will keep users coming back to your site? Try switching up your content! The Disruption Company leaves users curious for more because every time you refresh the homepage you’ll see a new and innovative brand video they’ve created for the homepage. We’ve seen some brands rotate the titles of articles or call-outs as well. These options could leave users with a unique experience on your website every time they visit. We’ve noticed more websites dabbling with different scrolling techniques for a unique user experience. Instead of a vertical scroll that you would typically see, Aces, a baseball recruiting agency, uses a horizontal scroll at the top of their website to grab users’ attention, show off the talented players they work with and give some fast facts about their business. We’ve seen other websites stray from traditional scrolling by focusing on different parts of the web design as users scroll. Throughout 2019, we’re excited to see the different forms of non-traditional scrolling designers experiment with. When Instagram rebranded their logo to the magenta gradient it is now, people definitely noticed. It was so different from the style at the time, but their decision to modernize gradients impacted design as a whole and has now become a popular design choice among creatives. 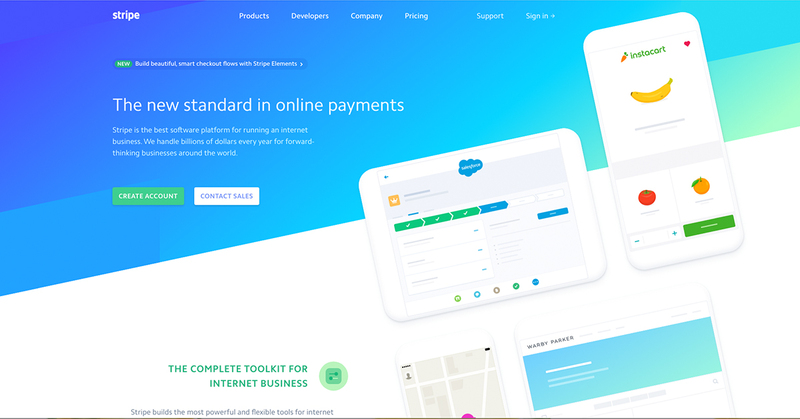 Another example of a modern gradient can be seen on stripe’s website. The incorporation of user interactivity has become increasingly popular and will only continue to rise. Consumers are spending more time on pages of responsive websites that utilize features with user interactivity. The obstacle with this UX design trend is clients hesitate to pay for the advanced interactivity, despite both their clients and their own team wanting to include engaging features like these. Our web design team's prediction for this year is that more automated development processes will appear and will hopefully slash the cost for clients who want unique, interactive features on their sites. A great example of user interactivity can be explored on Cocainenomics from the Wall Street Journal. This type of web design not only showcases a visual design talent, but it increases the website's time on page and brand awareness. In past years, we’ve seen the trend has been to use straight, horizontal lines to separate sections on website’s pages. After conducting some UX research on the matter, our team has discovered that using diagonal line design is not only visually intriguing, but it creates a directional purpose for the user’s eyes to follow down the page or to point to a call-to-action. Using diagonals in your designs will increase the number of users that scroll through the entire length of the site, which is why TaxiNet implemented this trend on their website. An interesting web design trend we’ve noticed becoming more popular is scroll animations. This type of web design not only showcases a visual design talent and front-end development skills, but it increases the website's time on page and engagement. Igor’s website does this by encouraging users to scroll or click through the page layouts to see their entire service line. As long as the animations don’t take away from your goal or confuse users, this web design trend can be a highly effective way to make it easier for users to convert. A web design trend that we are loving is the multiple color branding look. Companies like Camden Town Brewery are moving towards a web design that is branded based on page or product and changes when the user navigates and interacts with the product or pages. This web design subconsciously helps the user navigate through the site and associate which product or service page they’re looking at solely based on visual color cues. 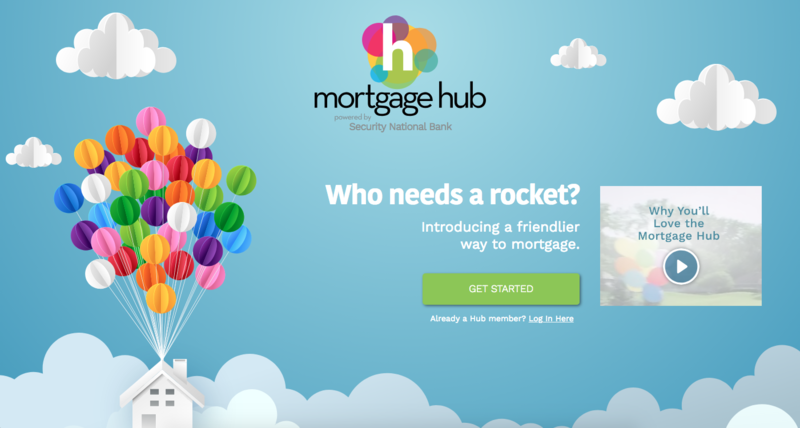 Our designers developed this web design full of drop shadows and varying colors to add depth and give the mortgage hub site a more complex look. We believe creating flat designs that appear 3-dimensional makes them more visually appealing and will sometimes lead users to the next step of the sales process. Some of the most common techniques to add more depth to web designs include using drop shadows, gradients or two-tone color schemes like the example above. In our rushed society, users seem to have less and less time to spend on websites. For this reason, design is adapting and including large, bolded titles and shortened messaging to capture their audiences fast and expedite their time to convert. The increased size of these heading tags is usually paired with much smaller sub-text copy if more information is desired. Austin Eastciders demonstrates this alliance of font sizes throughout their homepage design, and uses video to showcase different occasions to enjoy their tasty ciders. A web design trend that we are loving is the use of abstract shapes. We have begun to see brands move towards versatile shapes that give an extra element of intrigue for users. The elje group does a great job of introducing abstract shapes and graphics that resemble a lava lamp and will keep users intrigued. Notice this company has also started integrating modern gradients in their designs! 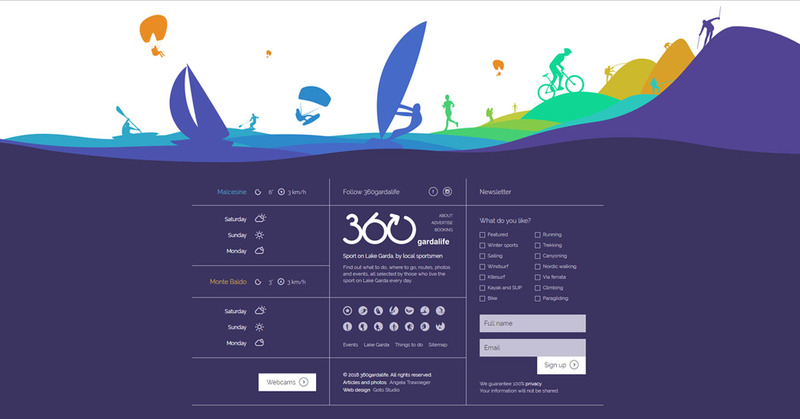 Over the years, the footer of a web design has often been overlooked or left out of the overall web design - until now. A web design trend making a splash are ‘footer boosts.’ What was once just used to provide contact information or a signup form has transitioned into a space to include additional elements of the homepage. A company that has done a fantastic job showcasing this trend is 360gardalife. As you can see in the image above, they have incorporated other elements in the footer space that now feels inclusive to the overall web design. Is your business ready to take your web design to new heights? We're an Iowa web design and responsive website development company with UX consulting experts that can do just that! Contact Blue Compass today.